Do ya think he saw it??? I wouldn’t mind so much — if I didn’t have miles of training runs hanging over my head. Which I am not doing outside. Which I am shortening on the treadmill because it’s so darn boring. 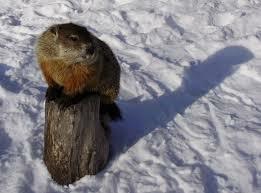 Ohhh….the shadow’s not that scary little groundhog. 6 more weeks? Really? Don’t be such a scaredy-hog!